Tickle the carb, shut the choke a little, retard the ignition (if you have manual), priming kick or two, ease over compression, ignition on, good swinging kick followed by a jarring kickback & a minute hopping about on the good leg. Familiar? Well, it was to me when my bike was on the standard points ignition & it got worse when I changed to the Vape CDI. The CDI has slightly less retard capability than the OE setup, & a very good spark, so any likelihood of kickback is made a certainty. Most Parilla people will know about the huge amount of advance needed with the hicam (anywhere between 48 & 53 degrees BTDC I’ve seen quoted) & I think the odd (by modern standards) combustion chamber shape, & high crown piston, gives a very awkward shaped space for the charge to ignite easily at kicker cranking speeds too. Anyone who bumps a Moto Parilla hicam into life will know its a bit easier than kicking. Well, I’m not entirely sure but I thought I’d better investigate when the CDI was fitted. I’d fitted one to a friends Morini single & it hardly needed a kick to bring it to life, the Parilla was now worse than ever! Ignition starts with the plug so it seemed a good place. That & the fact that the hicam head has a long reach plughole but the instruction is to fit a long reach plug with 2 sealing washers…must be a clue there? This is a standard NGK long reach plug, no extended tip. Note that even with 2 washers the plug face is inside the combustion chamber & the centre/outer electrodes are well exposed. This was the “certain kickback” setup. So I tried 3 washers. Better, but not a lot better, for starting. Now the plug face is level with the combustion chamber but the electrodes are still out in the open. Moving the electrodes back had improved the starting a little so the next step was to go all the way ….fit the shortest plug possible . So this was it. Short reach with the electrodes fully withdrawn from the combustion chamber. Result? Instant starting every time! So now I started to work back down the plughole with medium reach plugs, extended tips etc. The setup which gave the best starting & overall performance was a medium reach extended tip plug. 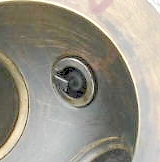 NGK BP7HS (or 8) with one washer. Its about 4 threads back from the end of the plughole but the centre electrode is exactly level with the combustion chamber, the tip is just inside. In this picture, you can see the electrode position better in relation to the combustion chamber. It was taken down the exhaust port. Various explanations have been given to me, from spark blow-out (unlikely with the CDI) to a pocket of “still” mixture trapped in the plughole. Whatever it is (theories invited) it works & doesn’t seem to affect the performance higher up the rev range. Soon after doing this experiment with my Parilla I started to rebuild my MV 175AB (now in the for sale section) & when I took the head off I was greeted with a short reach plug in a long reach hole….nothing new it seems.